Everyone has got their busy lifestyle, we need to arrange and do things that we love and like. I just back from the Hello Kitty in Oz media blogger trip. You can click on the link to read about it. Always be positive in life as there is up and down we need to go through. So don't forget that we need to work hard party hard play hard. Also time to take care of yourself too. 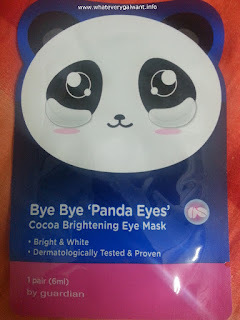 Do you have panda eyes? The dark eyes circles that you wake up and see yourself in the mirror. I have a short nap using this mask, putting on the mask for 10 min to 15 minutes. This new cocoa brightening eye mask with cocoa and carmellia leaf extract recharges the eye contour area. 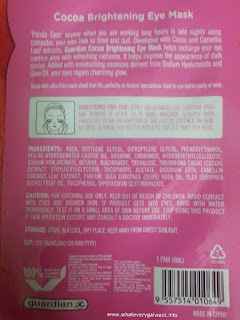 I like using this mask as it gives me the refreshing feeling. Having my pampering time, time out for my eyes 10 to 15min. This mask helps to recharge my eyes contour area with refreshing radiance. It helps improve the appearance of dark circles. Added with moisturizing essences derived from Sodirum Hyaluronate and Olive Oil, you can click the photo in pink for the ingredients. The eye mask sheets are made with ultra thin mask sheet that fits perfectly on Asian's eye contour. Ideal to use before party or work or before sleep. There is no need to rinse, after 10 to 15 min, massage slightly with fingertips to aid absorption of the excess essence on skin. guardian Cute Eye Mask retails at RM 1.98 per sheet. Meanwhile, guardian Warm Spa Eye Mask retails at RM19.90 per box with five sheets. You can purchase this eye mask at Guardian outlets.